Marigot, Saint Marten, 6 a.m. — The engines are quietly rumbling as Wind Surf makes her way into the snug harbor on the French side of St. Martin. Rising from my bed, I pull back the curtains to peer out of the portholes, only a few feet above the waterline. Across the rippling water are sailboats bobbing in the harbor, and behind them, layers of verdant hills and the rosy tint of the morning sky. Morning has broken in Marigot. I leave my stateroom to walk the teak decks up above. “Look at the starfish,” a fellow passenger exclaims, pointing below the water’s surface. The harbor is quiet, unlike the one at Phillipsburg, just five miles as the crow flies. There, on the Dutch side of the island, five mega-liners are in port, disgorging more than 10,000 passengers. Our ship holds 312. Small ships have their advantages. In a business where the race is on to build bigger and bigger ships, Windstar Cruises maintains a course 180 degrees opposite. With three motor sailing yachts carrying from 148 to 312 passengers, the Seattle-based company provides an intimate experience both at sea and in port. Sailing into harbors where the big ships simply cannot get into, Windstar functions much more like a private yacht than a cruise ship. 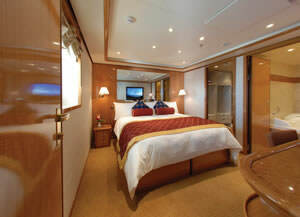 In addition to its standard staterooms, Wind Surf features two new suites, measuring around 500 square feet each. The Bridge Suites (on Bridge Deck) feature a living room, bedroom, walk-closet and a marble bathroom with a whirlpool tub, separate shower and two porcelain sinks embedded in a marble countertop. 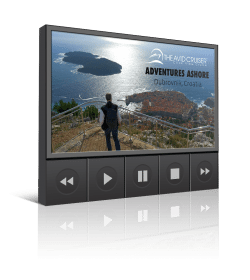 These top-of-the-line suites also feature two 42-inch flat-panel TVs (the TVs mirror one other with one in the living room and the other in the bedroom). Wind Surf also has 31 additional suites, measuring just under 400 square feet, as well as two decks of standard staterooms, measuring 188 square feet (some with third berths). Bedding features Sealy Posturepedic Premium Plush Euro-Top mattresses, luxurious cotton bed linens and duvets. 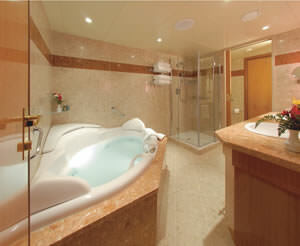 Bathrooms are appointed with Egyptian-cotton towels and waffle terry spa bathrobe. 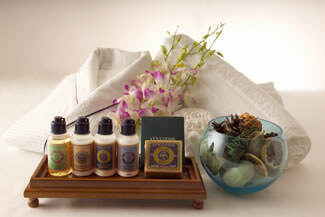 Bathroom amenities: L’Occitane, maker of fine natural body products manufactured with ingredients from Provence. 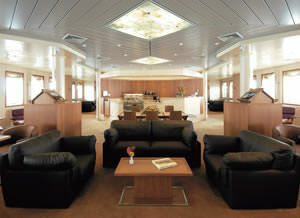 The social hub of the ship, The Yacht Club is an espresso bar/library/lounge all wrapped up in one attractive room, The Yacht Club features comfortable seating, as well as iPod listening stations. Books, DVDs and CDs are displayed and available for check out, and a large flat panel television was added for watching news, movies or sporting events. 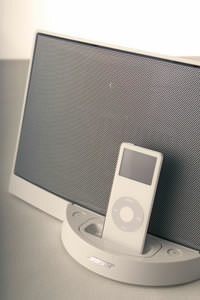 Also WiFi-enabled, The Yacht Club features eight computers for email and browsing the Internet for those who do not carry their laptops on vacation. Wind Surf features three dining venues: The Restaurant, Degrees and The Veranda. Degrees serves a steak house menu four nights a week and offers rotating menus from Northern Italy, France and Indonesia other nights. There is no charge to dine at Degrees, but reservations are required. The Veranda, serving breakfast and lunch, features an expanded covered outdoor seating with awnings. During my Caribbean cruise, The Veranda was put to good use for breakfast and lunch. The awnings are breathable, so that they don’t flap in the gentle winds, and they make the sunlight tolerable. The Veranda also features air-conditioned indoor seating as well. Situated aft, moving up from Deck 2, is the Pool Bar, serving light snacks; and the Compass Rose, serving Continental Breakfast, afternoon tea, and evening appetizers (also available in the main lounge). 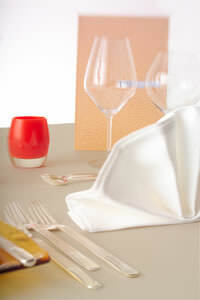 Room service, which is complimentary and features excellent choices, is offered 24 hours. Late night departures also allow people to go into town for dining. Indeed, on the evening we were to depart Marigot (a destination renowned for its cuisine), several people either went ashore for dinner or for after-dinner drinks, returning just in time for the after-midnight departure. The “ambience” that the passenger from New York appreciated so much (and keeps her and her husband returning to Windstar) is reflected in the relaxed and unregimented lifestyle aboard Wind Surf. While gentlemen might not feel out of place wearing a jacket on the most formal evening of the cruise, the Captain’s Welcome, jackets certainly aren’t required. I saw no more than six men wearing jackets in the main lounge during the Captain’s Welcome. I never saw anyone wearing a tie. Women were dressed equally as casual. Setting the relaxed mood, even the officers wear shorts during the day. Officers, in fact, dress as if they were on a sailing yacht, which is what Wind Surf is. Captain Tim Roberts confides that he becomes slightly offended when asked repeatedly whether the sails really do work. That’s because he is a sailor at heart, and he doesn’t want anyone thinking that the sails are just for show. “The sails actually have more power than the engines,” he says. “We can do about 9 knots in a good wind.” And when the wind is just right, Captain Roberts cuts the motor power altogether. For curious sailors and wannabes, Wind Surf has an open-bridge policy. I stood not in the bridge but in front of it during one night of my sailing. There, with no lights to obscure the vision of the ship’s officers, I needed only to look up along and beyond the trim lines of the Dacron sailcloth to witness the wonder of the universe. Stars sparkled like sequins against a pitch dark backdrop. A buddy and I named as many constellations as we could, before saying good night. The easy lifestyle on Wind Surf had forced me and 311 other passengers to slow down beneath the stars and sails on a beautiful blue sea. 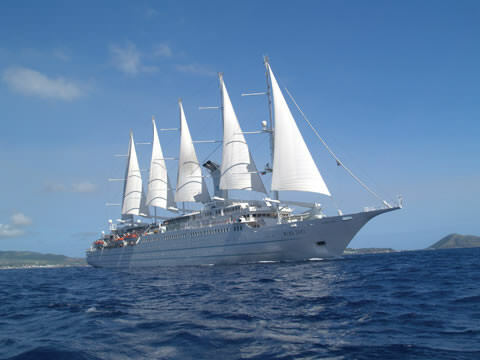 Wind Surf offers the perfect cruise for those willing to allow the wind to steer them. 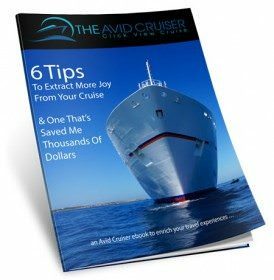 In Europe, Windstar offers an assortment of 6-, 7- or 8-day cruises, including a new Venice roundtrip sailing will feature the picturesque, historical Croatian destinations of Rovinj, Split and Dubrovnik as well as Koper, Slovenia. Also debuting in 2009 onWind Surf itineraries is the port of L’lle Rousse, France on the island of Corisca with its charming seaside villages, towers and citadels and Ischia Island, Italy with its rugged natural beauty and thermal spas. In summer through early fall, the 148-passenger Wind Star and Wind Spirit return by popular demand to the Greek Isles. Sometimes, seven days just aren’t enough. That’s why Windstar’s Connoisseur Collection offers back-to-back itineraries allowing you to combine two, one-week sailings into one luxurious 14-day sailing that rarely, if ever, repeats a port.